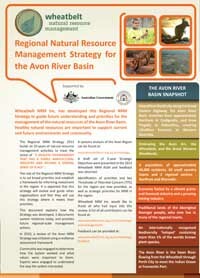 Future strategic investment, into natural resource management (NRM) within the Avon River basin, is essential to assist the community in achieving its objectives for maintaining the health and prosperity of the natural environment. The Wheatbelt Regional NRM Strategy guides NRM investment priorities within the region. The regional community provided important guidance to the development of the strategy, which reflects their values and understanding of the environment they live in and know. The Regional NRM Strategy identifies areas where investment is likely to have the most significant and long-lasting influence in achieving NRM outcomes.